The Peregrine Falcon is the ultimate winged predator. The fastest living creature on the planet, it has been recorded at 254 mph diving for its prey. Flying on the level without wind assistance it cruises at 60 mph. It’s eyesight is such that it could tell the colour of your eyes at 1 mile distance. It was on the verge of extinction in the UK in the 1960s through persecution and being poisoned by agricultural chemicals. Over the last 50 years it has slowly recovered and there are now about 1,500 pairs. As a bird watcher for many years it has been my ambition to see one of these fantastic birds at a distance where I could see the detail of their feathers. Over the last 30 years I have seen several at a distance, but never close to. That was until last week. 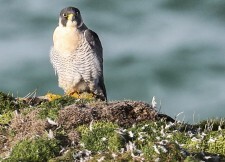 On a sunny weekend afternoon my wife and I were walking our dogs on a cliff top walk that we know well, when I suddenly spotted a peregrine sat amongst a pile of feathers on a little cliff top promontory. It could see us and did not seem unduly bothered, so we approached it slowly till we could see it clearly with our naked eyes. I did not have a camera with me, so of course it posed for me in the sun. As we were looking at the bird another peregrine started shrieking in the sky above us, before it dived past us and settled on a cliff ledge a little way away. We has stumbled across a feeding ground and wind shelter for a pair of peregrines. After a short while they both flew off. The site was about 15 minutes from cottage we were staying in, so during the course of the next week I repeatedly revisited the site. In photographic terms the conditions were dreadful, grey cloud, wind mist and rain were the predominant conditions. On most occasions I saw the peregrines in the air, mere specks in the distance and on the two times one was on the cliff ledge it resolutely kept its back to me. On our last afternoon, the sun was out and I went up for a final time. 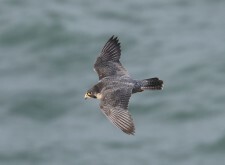 There again was a peregrine on the cliff top amongst a scattering of feathers with the sun shining on its chest. I was about 50 yards away and it had its beady eyes on me. To get a photograph I really needed to halve the distance without disturbing the bird. I just walked as slowly as I could one pace at a time allowing the bird to watch me. When I got to where I wanted to be, I slowly sat down and then started taking pictures. I needed to take as many as I could because with a long lens in high winds there was a real risk of motion blur and focusing on the bird was hit and miss. I sat there for about 5 minutes before the bird calmly flew off and I got an image of it flying as well. Like most wildlife photography, the images are a result of luck and perseverance . 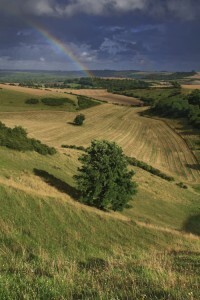 I have walked virtually every footpath in the Chalke Valley. It is hard not to be captivated by the vistas where ever you walk in the valley, but there is one spot that I keep on going back to time and time again – sometimes specifically to photograph it, other times just to admire the view. 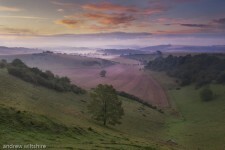 It is just off the oxdrove that runs along the northern ridge of the valley. About midway between Alvediston and Berwick, there is a path running south from the oxdrove: follow that for a hundred yards and the view opens up before you. From a photographer’s point of view it it is probably the best spot in the valley for capturing the sunrise. Anyway here are 4 photos taken from the same spot showing how different the view can be depending on the weather. Walking back from a friends house the other night , I was amazed by the clarity of the milky way and decided that a photo of the galaxy had to be my next photographic project. The first problem was where to take the picture as I needed something atmospheric in the foreground, but with no light pollution. I decided on the ruined church of Knowlton which is near Wimbourne St Giles. This a well known pagan site and the church stands in the middle of a neolithic henge. . When I arrived at 11.00pm, I could see a group of people close to a pagan shrine that is there. If they were going to be there all night, this was going to be a problem for me as they had bright lamps. I walked over towards them and as I came into the fringe of their light, two of the girls in the group started screaming – not an effect I often have on people. It turned out they were a group of teenagers who had heard the site was haunted and they were ghost hunting – they thought I was a ghost! After an hour or so they left and I had to wait and wait for the slight cloud cover to clear – the weather forecast had promised me a cloud free night. It was past 2.am before the cloud cleared and I could get to work. Sadly, even in this remote location I could not avoid light pollution, Poole is glowing on horizon, but I think the picture was worth the sleepless night. Springtime and autumn are the times when woodland is at its best. In spring the freshness of the colour of the leaves lifts the spirits after the drabness of winter. also the ground cover busts into life – wood sorrel, dog mercury, stitchwort, primroses, wild garlic and bluebell. Fresh leaves, flowering ground cover and low sunlight and the scene become magical. 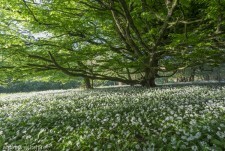 The picture below is an example of how great woodland can look in spring. The weather forecast was quite clear – torrential rain with heavy cloud cover and gale force winds. However the dogs needed a walk and I thought I might as well take my camera equipment with me just in case. I climbed up the eastern flank of Black hill from Crasswell which is a fairly steep upwards haul of about 300 m. There was no wind and a light drizzle as I climbed, but as I reached the top of the slope and climbed onto the top ridge, the westerly wind hit me. I could hardly stand up, so that part of the weather forecast was right. 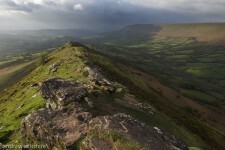 It was also raining, but what I could see over the Black Mountains were small breaks in the cloud cover with shafts of sunlight racing across the ground. If one of those shafts would hit the ridge known as Cat’s Back to my left, then I might have a worthwhile picture. So with considerable difficulty I set up my tripod, mounted the camera, huddled in the rain and waited. I was in luck, a shaft of bright sunlight hit the ridge, so off came the lenscap, remote shutter release pressed and I had a picture. Had I relied on the forecast I would not have taken the camera, as it is I have what I think is quite a dramatic image of one of my very favourite places. 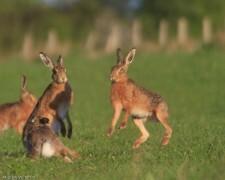 The jack in the middle is chasing the leaping hare away from the doe. A jack trying to impress the doe by standing up. She does not look that impressed. 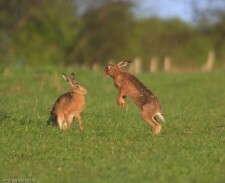 Here again we have jacks chasing each other, the doe looks on whist she munches a shoot or two of spring barley. 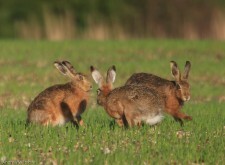 Doe on the left and jack in the middle sneaking up to see if he might be in with a chance. 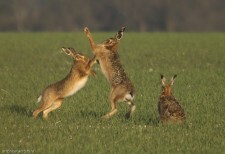 The doe is delivering the right uppercut into the jack’s armpit. he backed off and the spectator did not move. 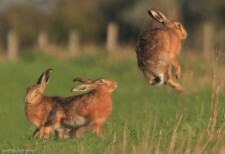 Get it wrong and the jack gets a good thumping. It is probably a good thing that I can get by with very little sleep as my favourite time for being out to take photos is as dawn emerges until the sun rises. In Scotland in the summer my willingness to get up early is severely tested as I need to be out of my bed between 2 and 2.30 am. as sunrise is just after 4 and it can start getting light up to an hour and a half before hand. 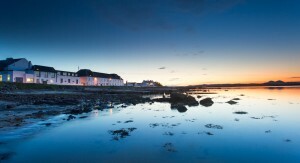 This picture of the Distillery at Bruichladdich on Islay was taken just before 3 am. and you can see how light it is already. My reasons for liking this time of day are not only related to photography. 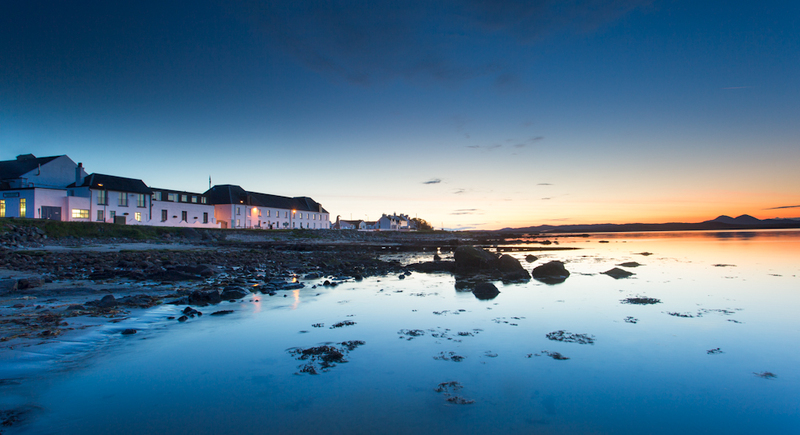 To stand in one place watching the world about you being slowly illuminated and coming to life is always inspiring, even in sub zero temperatures, or in the case of the west coast of Scotland as midges come to life and plague you. Sometimes the wildlife is rather more appealing than midges, I have had badgers trundling past me quite unconcerned if I stay still. More often than not you have where ever you are to yourself with a wonderful sense of solitude. 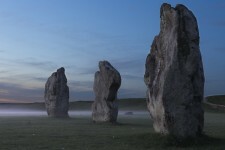 For instance, hot spots like Avebury are deserted. The biggest plus for these early rises is that sometimes an ordinary scene can be made magical by a combination of light and weather and you get to see it when most don’t. Take Stonehenge for example, when you drive past in on the A303 it does not look that exciting, even if it is one of the world’s great monuments. Like most photographers I check out both weather and the position of the moon. Last September I noticed that a full moon would be setting over Stonehenge to the west and it would be cold with minimal cloud cover, that was enough for me to get in position at 4 am. to watch and see what happened. I was about 1/3 of a mile to the east of the stones on a hillside level with the stones but with a valley between us. The A303 was a short distance to my left. Initially the moon looked very nice, but there was nothing of great interest. As the dawn gave a slight light, a pillow of mist started forming in the valley, which as it got lighter grew until the valley and the stones were obscured by mist. So I had a blanket of mist illuminated by the moon. It really was not very promising, and I suspected that it would be another trip where I never pressed the shutter. But, I just kept waiting and just after 5 am. 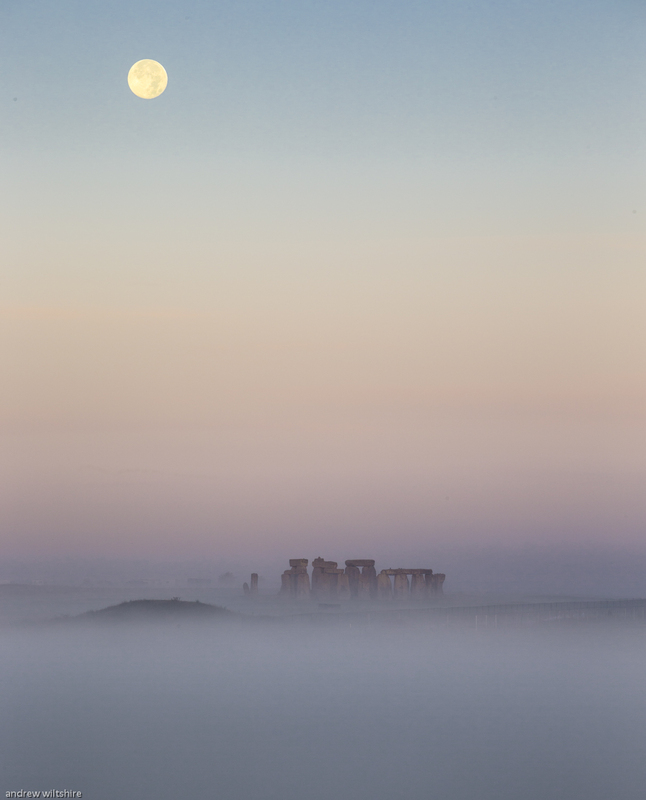 the mist over the stones evaporated and I had the stones emerging from the mist with the moon above. I pressed the shutter release a couple of times and then the mist enveloped the stones again. 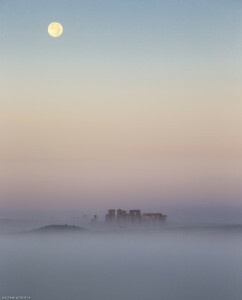 The stones, moon and mist had been visible for perhaps 30 seconds, but I had seen it and I do not think anybody else had as there was no traffic on the A303. All the pictures so far in this post have been as a result of getting up at stupid o’clock. You don’t always have to get up early to see in the dawn. For instance, for the picture below, I’d had a nice lie in followed by a good breakfast and then driven an hour or so in the early morning gloom to my location. After that I watched one of the best sunrises I had ever seen and it was about 11am. 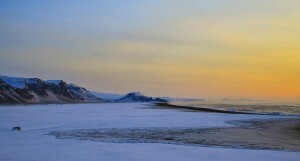 I was in Iceland in early January. Use this to waste time or as a screen saver.